Helped by a growing set of hacking tools, criminals are targeting mobile devices more than ever to access valuable data, threatening user privacy and confidential information. Common vectors of attack are on another computer using the same Wi-Fi, a compromised wireless router, or a rogue access point. To protect against malware injection or data theft, mobile devices should systematically use a VPN when on untrusted Wi-Fi. 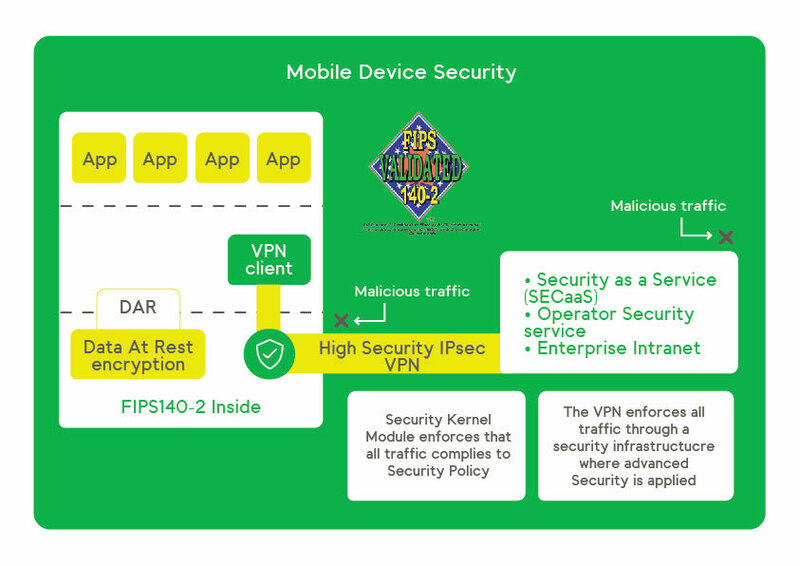 Our solutions rely on FIPS140-2-validated cryptography to protect the data through device encryption and IPsec VPN. GUARD VPN Client (previously QuickSec® VPN Client) provides Android devices with a highly secure IPsec connection. Developed and maintained by security experts, it is widely used by tier 1 customers to meet the demanding requirements of governments, enterprises and operators. It is available as a pre-loaded version for OEMs enforcing top security all the way to the kernel, and as a downloadable version. GUARD products are shipping in volume through leading device vendors. They are delivered in source code to provide complete flexibility and transparency to our customers.